This one goes out to my husband Joe. 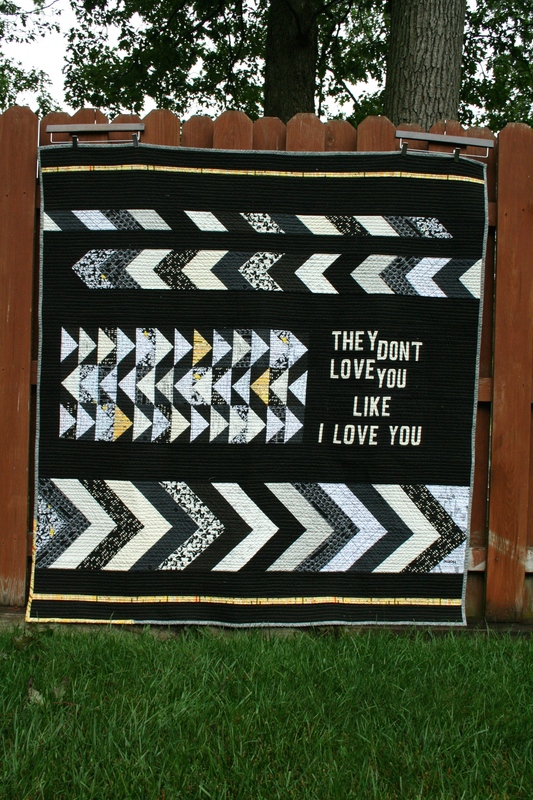 I have so much to say about this quilt, but today I will let it speak for itself. 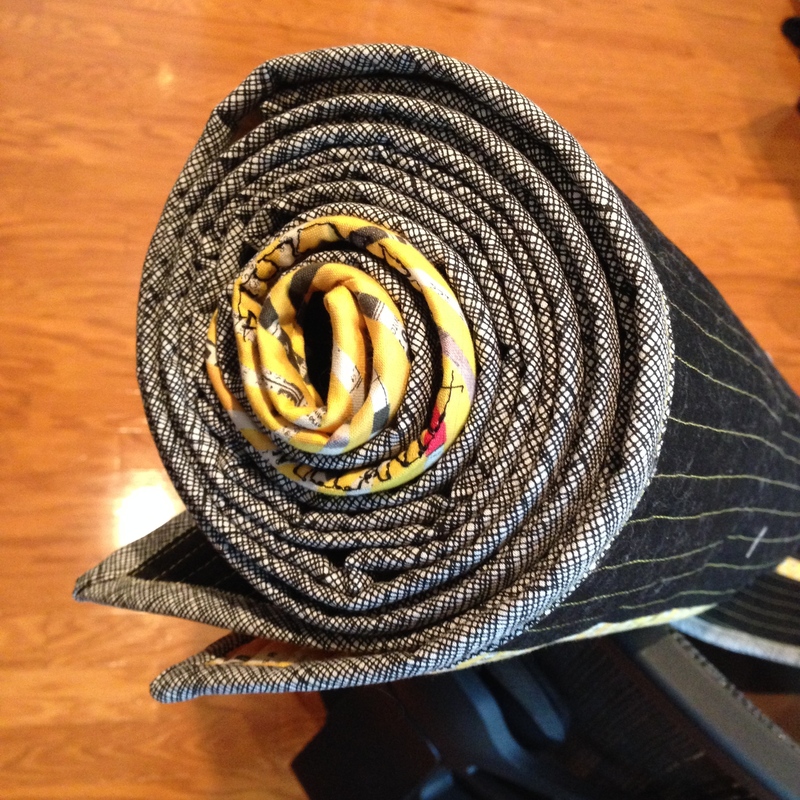 The main fabric is Kona Black and Bone. The yellow is from Collage by Carrie Bloomston. There are lots of text prints and some black on black, including a keyboard print that I picked up in San Francisco in the fall. There’s also an awesome panda print that Joe picked up for me in Japan last year. 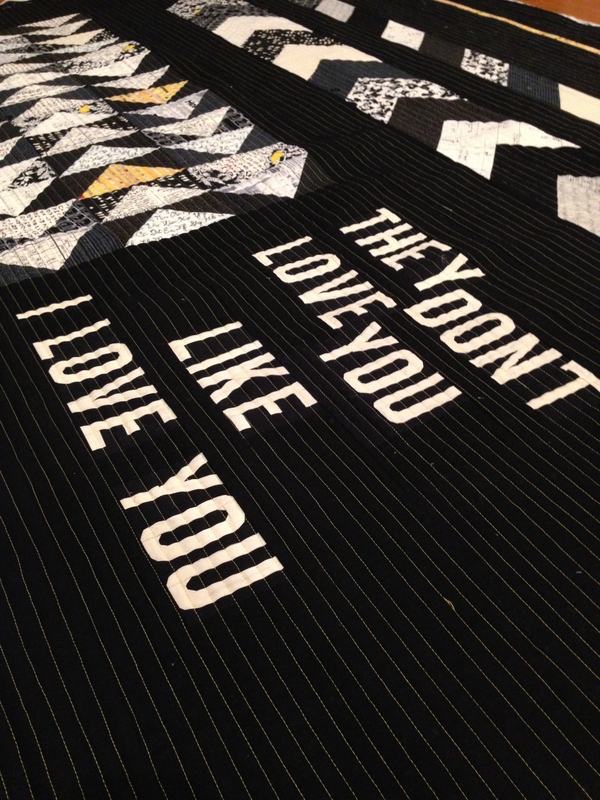 Fabric is my new favorite souvenir, and I love using it in sentimental quilts like this one. I ran a little short of my binding fabric, the perfect Crosshatch from Carolyn Friedlander’s Botanics, so I cut some of the yellow on the bias and wrapped it around a corner like I did on the Aerial quilt. I love the look– this might be my new signature binding. 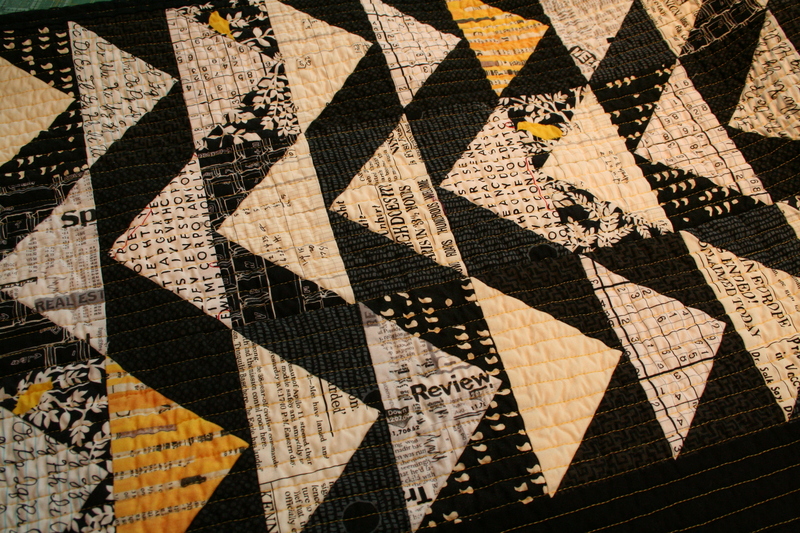 The back needed to balance the black and white, so I went for my favorite quilting color, yellow. Lots and lots of yellow. It makes the whole quilt feel warmer. Joe requested a Triforce from the Legend of Zelda, and so I got to learn how to do 60 degree triangles! Win win. (This was my second try.) I love how the newspaper strips are on an angle to imply its shininess. So geeky. So us. 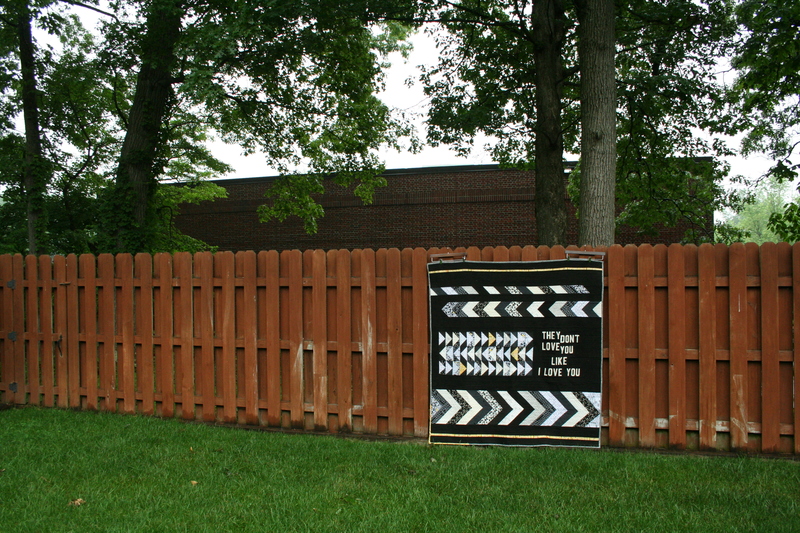 It finished up at 68″ x 72″. Perfect for a man-sized couch throw. Thanks for coming to check it out! Have a great weekend. Oh, and remember that giveaway I promised? I’ll post it this weekend. It has something to do with my quilt holder. Wonderful. My husband is my rock. (and I LOVE rocks!) So I totally get this. It’s such a nice quilt! I’m impressed your lines are straight with your letters! I’m sure my lines would have ended up a few degrees off, haha. The binding looks great! What a wonderful post. 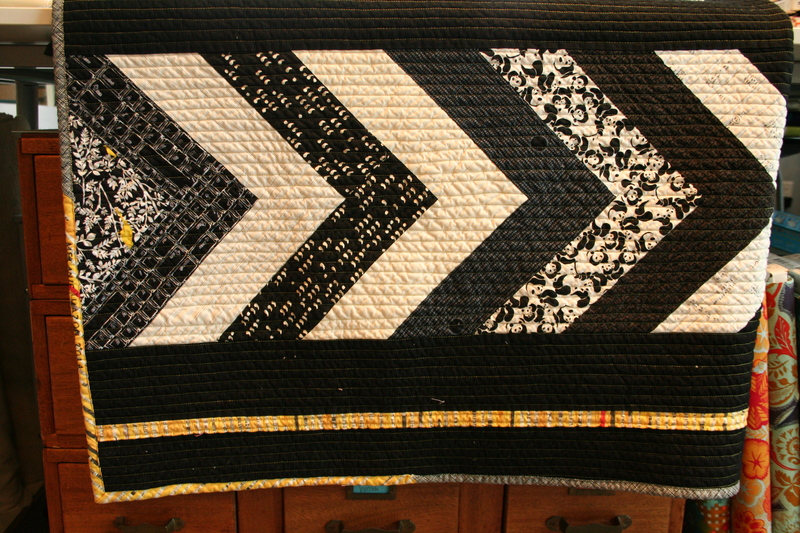 : ) The quilt is stunning! Love the added yellow in the binding, too. This kind of quilt is my favorite kind. The ones that mean so much. You can just feel it when you look at it! Well done!! Oh, Melanie, it is the perfect quilt. Stitched with love for a great guy. What a beautiful way to express your love for him. You guys are the best! 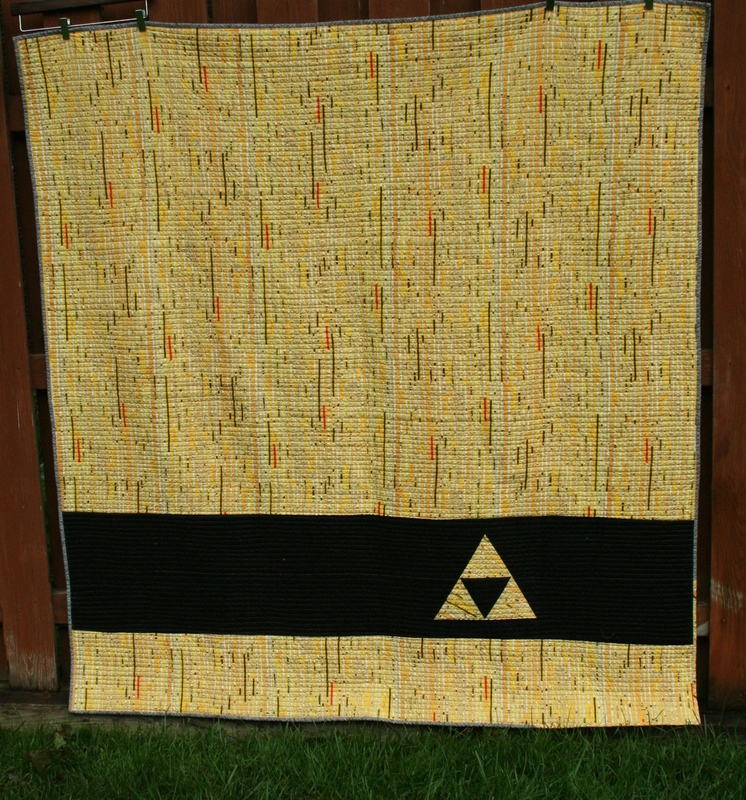 Can you tell me how you did the triforce on the back? I actually want to make a quilt that looks like the back!